I wasn't just nervous. I wasn't just stressed, even. I was actually afraid - afraid I would either fail or I would hurt myself severely. Afraid I would let down everyone who has been supporting me and believing in me. Afraid I would let myself down, knowing that (due to other life things) I won't get another chance to do this for a while. The voice in my own head is always the meanest and the most severe. I was in pretty bad shape, mentally and physically. I wasn't going to quit or anything, but I was seriously considering adjusting my numbers down or dropping to just push/pull (bench and deadlift, no squat). BUT... I knew I would never be happy with myself for it. Even if it would've been the right decision medically, could you be happy settling for less when you know that you're truly capable of more? I could accept it as necessary, but I could never be happy about it. So even as I showed up to the weigh-in and submitted my planned numbers, I was unsure of what my actual fate would be when I woke up the next morning. My knee had been slowly getting better all week thanks to rest and aggressive manual therapy, but I wasn't sure if it would be well enough to support all the weight I planned to squat. I'm familiar with the poem, but I haven't read it or thought about it ages, so I found it quite fortuitous that it should happen to reappear in my life at that particular moment. I woke up Sunday morning with the last two lines repeating in my head, some minor discomfort in my knee, and a very clear sense of possibility that I hadn't felt for quite a while. One voice had risen above the others in my head, saying "I can. I CAN." It was a good sign. And lo and behold... I was a little wobbly for my first squat, but I was successful, and moreover, my knee held up. I finally released the figurative breath I had been holding. Shaking with relief, I decided to stick with the rest of my plan for my squats, and got back in line. I nailed all three attempts, ending with a 15lb PR at 440lbs. I felt all the stress (well, not ALL of it) whoosh out of me as I walked off the platform after the third squat. It's funny, isn't it? I literally put weight on my shoulders, and it took the figurative weight off. I knew that was only the first lift of the day, but it had been my biggest worry, and now that I had hurdled it, I felt infinitely better. Hours later, it was time to bench, and I was nervous again because it's my weakest lift. I had decided long ago that this was not the time for heroics - my main goal was just to land at least ONE of my bench attempts, so that I wouldn't get DQed; I was not going to try to PR that day. I had already talked myself into being fine with going 2 out of 3 on my bench press, and surprisingly, I almost made all 3. I have only ever benched 175 one time, at the gym, and it was really NOT a clean rep, and I struggled with it so hard. So color me surprised when I benched 176 for my third attempt! Except... it didn't count. I got red-lighted because in all my nervousness over that number, I completely forgot about waiting for the command, and started pressing up too early. So while officially, the second attempt at 165 was my best bench on record, I couldn't be too upset with myself over failing the third one, because I at least know now that I am physically capable of hitting that number. I just need to not do stupid things like forget about the rules while I'm up there :) Lesson learned. Finally, over 8 hours after the meet had actually started, it was time for deadlifts. It had been a long day, and I was practically dozing off in the hotel lobby, but deadlifts are my JAM. If I'm being honest (which I usually am), I have reached the point where my deadlift numbers even scare ME, so I tried not to think about them, and just told myself that all I had to do was to go up there, pick up the weight, and then put it back down when they tell me to, and then repeat twice more. As I stood there waiting for my first attempt, I was transported back to November, when I was there competing in the deadlift-only event. It has again come down to this, me and my favorite lift. And then I was home free. (Of course, I am aiming for bigger numbers than before, but omg don't think about that don't think about that don't think about that.) I remembered the surreal feeling of everything kind of falling away as my eyes zeroed in on the bar at my feet. When I set the bar down for the third and final time, I felt like the room had exploded, and finally, all the rest of the stress and tension I'd been holding inside for weeks dissipated. 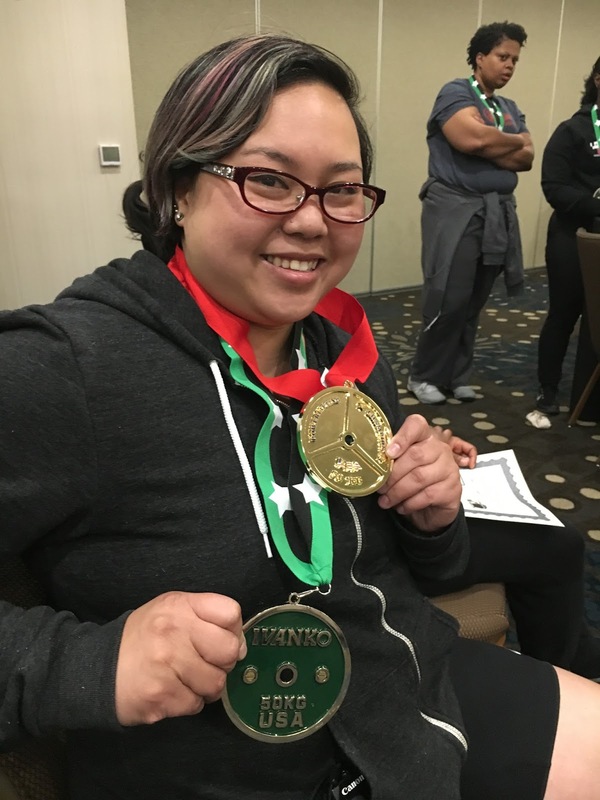 The gold medal is for winning overall Best Female Lifter (Open division - the other two divisions for this award are Juniors and Masters). THIS one... this one is a biggie. I mean, I am surprised to have won anything at all, but I was beyond thrilled and honored to get this one, because this award covers ALL the female lifters in the open division. I'm not going to get into weightlifting coefficients and how exactly they work, but the basic explanation is that there is a mathematical process that tries to compare all the lifters across different weight classes by taking into account various individually-based factors to see who is the strongest lifter/had the best lifting performance overall. So there are certain factors that might make someone able to lift more weight, such as being at a higher bodyweight (because a 200lb person has more potential to lift heavier weights than a 130lb person) and age (think 20-somethings lifting compared to 70-somethings lifting, which we had both of at this meet), and when you try to balance out those factors mathematically with a weightlifting coefficient and the lifters' raw scores (squat + bench + deadlift) for the day, it gives you a way of seeing who the top lifters are for that meet. So, even though there was a woman there who had a higher raw total than me (she was very cool and SO IMPRESSIVE, and we totally connected), our totals were actually very close (within 20lbs of each other), and she was two weight classes above me, so... it went to me. *squeak* Trust me, I was surprised that it wasn't her, but that's what the coefficients do, I guess. I was very honored and gratified all the same. Me, getting a gold medal at an athletic event?? And being within striking distance of a 500lb deadlift? In what UNIVERSE would I have ever dreamed that possible? Lift like a girl - lift like us! I don't know where I'm going to go from here - because of moving and family planning, my future as far as lifting is concerned is rather nebulous. Even though I've found what looks to be an awesome powerlifting gym I could join in Oregon, I honestly have no idea what the future will hold, when I will compete again, or even IF I will compete again. I have no guarantees right now, and I am so, so happy that I had this chance to prove to myself that I could do this, to go out on a high note and to make myself and everyone else proud. There are just some moments in life that you know will stick with you forever, and this was one of them for me. I will hold onto this day and cherish this experience in the time to come. Catherine of Bay Area Manual Therapy Center, who went ABOVE AND BEYOND the call of duty and friendship to make sure that my knee was the best that it could be for the big day, including driving up early Sunday morning to massage my leg before I started warmups. She really saved me, and she deserves her own ginormous medal. Gabe, my fellow ASC competitor - I'm glad that there has always been someone else there sharing this experience, and I'm glad it has been you. Congrats on joining the 1k club!! !